When it comes to safety and protection, security cameras are often one of the best bets. Whether indoor or outdoor, security cameras allow you to keep an eye on your property. Further, outdoor security cameras can act as your first line of defense against intruders. These days, there are many styles and technologies to choose from when it comes to security cameras. The most common type is analog surveillance cameras, which work with CCTV (closed circuit television) software. Network IP security cameras are a bit more expensive than analog cameras, however, they offer more advanced technology and features. Whether you go for analog or network IP security cameras, the style of the camera adds more options and benefits. You can choose between wired or wireless cameras, which can easily be determined by the desired location for your camera and the available power source. Bullet and dome security cameras both boast great versatility and features, but may be better suited for different settings. You may also benefit from other styles, such as hidden/nanny cams, infrared/night vision or day/night cameras, and more. With that said, it is imperative to choose the appropriate outdoor security camera for your home security needs. 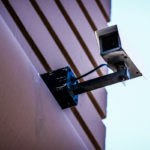 Before you start shopping for outdoor security cameras, you may want to take a walk around your property and take notes. Considering the different types of security cameras out there and the layout of your property, some styles may be better suited for certain areas. Bring someone along, like a family member, or have someone you trust do this as well so you can compare notes. Sometimes a fresh pair of eyes or a different perspective may uncover things you didn’t initially consider. Some things you may realize, for example, could be that if there are no streetlights near your home, infrared/night vision cameras will be helpful. Or that your open yard area could use a PTZ or wide lens camera for better viewing range, as opposed to a bullet camera, which may be more fitting for targeted areas like your front door. Besides taking a look at your perimeter, another thing you may want to do is sit down with your family to address personal concerns. Your family members can offer insight on what areas they would like to be monitored. For example, security cameras at the front door or near driveways allow you to see who is approaching your home. Or you may want to keep an eye on pets or livestock, so a camera placed in that area may be necessary. One thing that seems to be helpful is remote access to your security camera feed while you’re away. Most security cameras on the market today support this feature. If you have any questions about security cameras, or are simply looking for affordable, top quality surveillance camera equipment, please feel free to call 1-888-203-6294 or visit us online. You may also connect with us on Facebook, Google+, Twitter, or Pinterest. Your home security system can be made up of a variety of security measures. Locks, alarms, motion sensors, the list goes on. However, security cameras can play a defining role. Security cameras can capture important footage when it comes to identifying suspects and for the purpose of hard evidence. But the goal of a home security system is to stop criminals before they act. Outdoor security cameras can help to deter burglars from targeting or entering your home. While indoor security cameras provide their own benefits, outdoor security cameras can act as your first line of defense. Outdoor security cameras are built differently than indoor cameras in the sense that they must withstand much harsher conditions and adjust to varying lighting conditions. If the camera isn’t weatherproof, waterproof, and vandal proof, there is optional housing you may purchase, built to preserve and protect your cameras. The location of your outdoor security cameras is ever important. You want them to be seen, yet not within reach for tampering. Evaluate the perimeter of your property, taking note of any places where burglars can hide or any dark corners. Common points of entry and detached garages or tool sheds will also warrant surveillance, as they are easier targets. Wired outdoor security cameras will have a relatively reliable power source, as they are physically connected to it. However, depending on the location of your cameras, additional wiring may be necessary, and, consequently, may cost more. Another downside is that burglars can cut wires to disable your system. Wireless security cameras are easy to install and move from different locations. Since they run on internal batteries, you must closely monitor your battery power to ensure your system is working properly. Also, wireless systems run the risk of interference from other electronic devices nearby. While there are pros and cons to both types, you should consider your circumstances and choose the types of security cameras which suit you best. Image quality is important, especially outdoors where lighting conditions vary constantly. It is wise to choose security cameras with high resolution and day and night vision. These cameras will provide improved quality images in varying lighting conditions. Remember, color cameras may produce better picture quality, however, black and white cameras typically work better in low light conditions. As stated previously, choosing cameras that weatherproof, waterproof, and vandal proof may fare better in the long run. Your recording and storage needs will depend on how you want access and save your footage. There are digital video recorders (DVRs) for most cameras, while network video recorders (NVRs) are usually reserved for network IP cameras. DVRs and NVRs usually store footage on a hard drive, but the size of the hard drive will depend on your individual needs. You may also set up a schedule for your system to delete old, unnecessary footage. You can monitor your feed in real time on a monitor or your home computer. Some systems also offer remote surveillance, where you can access it through your mobile phone or device/tablet. These offer added convenience and can even alert you of suspicious activity. Should you require any help on deciding which equipment works best, feel free to contact us. We carry a wide range of security cameras and camera packages to suit your needs. We also provide installation, programming, and support services. Visit us online or give us a call 1-888-203-6294. You may also connect with us on Facebook, Google+, Twitter, and Pinterest.